Every Sunday at the 9:00 AM Mass, St. Mary's offers a special Children's Liturgy of the Word. Children of the parish are invited into the Chapel to experience the Liturgy of the Word through readings that are interpreted specifically with younger listeners in mind. Parents are welcome to join their children in the chapel during that time. 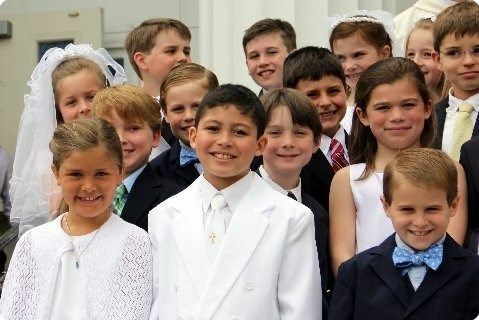 An "Adult Minister of the Word" (AMW) leads this portion of the liturgy and children of reading age are invited to become Youth Lectors to deliver the first and second readings. The AMW then reads the Gospel and directs the children through a guided discussion around the meaning of God's word in the readings. Children's Liturgy of the Word is a great opportunity for your son or daughter to experience the word of God in a way that tends to be more accessible to children. The program has been very successful with many kids attending on a weekly basis. Children are invited to sign up to become Youth Lectors and we are always looking for more adults to help as Leaders. It is an incredibly rewarding experience! For more information, please contact Bob Hofmann, bhofmann03@verizon.net, 781-545-7472 or Debra Moxie, debramoxie@gmail.com.